If you have to go to hospital for treatment, you want to how long you’ll be staying and how much it will cost, so that you can prepare yourself mentally and take care of all your practical arrangements. The hospital wants this information too, so it can work out what resources, scheduling and financial planning are required. That’s why Sint-Rembert hospital in Torhout is now working with a more intelligent and better reporting system, also so it can rule out any unpleasant surprises. The aim is to read in various types of data file (with medical diagnoses, medicines, number of bed days, admission and discharge details), as well as plan staffing requirements. This enables the hospital to check which teams will need extra support in busy periods, calculate the cost-price for patient interventions, group activities together by health insurance codes, work out the total cost of treatment, assess the ratio between bed days and personnel planning, etc. Together with an analyst and the hospital’s IT team, we set up a proof-of-concept reporting system for MS Power BI. The hospital already generates a whole series of reports, but they still require hours of manual work and are difficult to share with all hospital employees. These lost hours are becoming a thing of the past, however, thanks to MS Power BI. 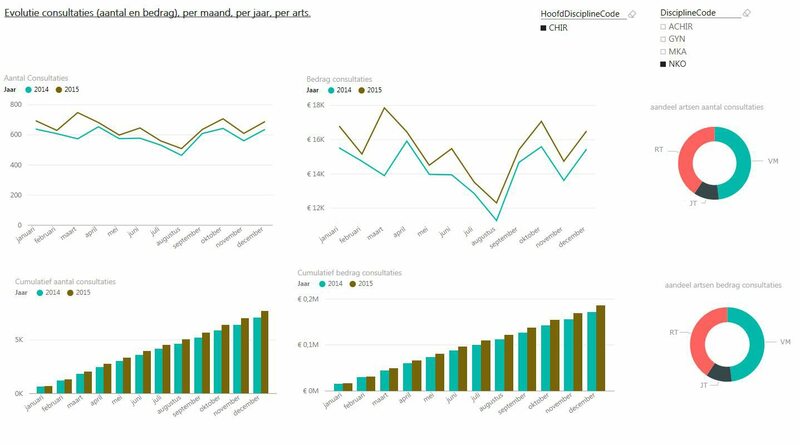 Users can now perform their own analyses and create interactive reports with the new reporting system, using pivot tables, standard reports and dashboards in Microsoft Excel. 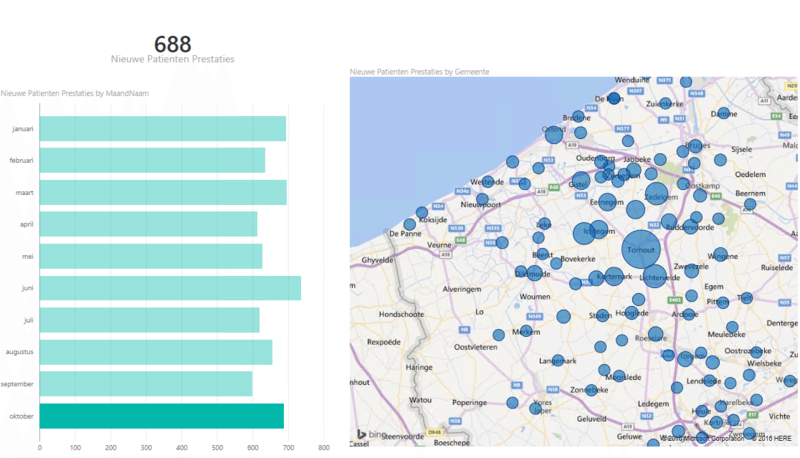 The PowerBI.com online dashboard is also used to centralise core figures for management. This means the IT team saves time making calculations and creating reports, so it can focus on continuously improving core applications and providing user support, and managers can see the most important details at a glance. Managers in the hospital will soon be able to consult reports and look up all sorts of important information: patient histories, how long they’ve been admitted, which interventions are performed the most, how many consultations there have been, performance compared with previous years, checking to see if there’s an increasing need for certain disciplines, and so on. We always come up with new possibilities when we talk about reporting with people at the hospital. Our technical assistance at Sint-Rembert consisted of setting up an SQL Server database on a new virtual machine, modelling a data warehouse, converting the original DB2 data to CSV data sets with calculated tables, and structuring the basic data in a so-called tabular model. This means we’ve got everything ready to start to building the reports in Microsoft Excel using the Power Pivot add-in, and have set up interactive dashboards with MS Power BI. We’re now training the analyst at the hospital to become an expert in smarter reporting.